Just like humans, plants have an immune system that helps them fight off infections. Plant immunity has some important differences: they don't make antibodies and can't fight off the same bug more quickly months or years later. However, plant cells can identify pathogens and react to them, often by producing a burst of reactive oxygen which is toxic to bacteria or fungi. Cells around an infected site will go into programmed cell death to seal off the disease. Gitta Coaker, professor in the Department of Plant Pathology at UC Davis and colleagues have now identified a key step in how plant cells respond to pathogens. They have identified a family of kinase enzymes that activate the enzymes that make reactive oxygen. The work is published Sept. 12 in the journal Cell Host & Microbe. 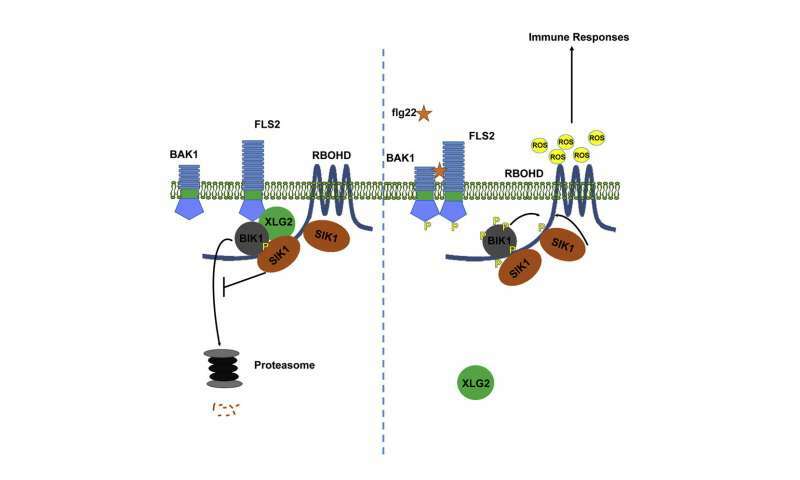 "It was known that plants can produce reactive oxygen, but not how different proteins coordinate activation of the reactive oxygen synthase," Coaker said. Every plant cell can respond to pathogens, Coaker said, through receptors on the cell surface that react to things like bacterial proteins. Plants have a large repertoire of these innate immune receptors: the small laboratory plant Arabidopsis, for example, has about 600 receptors that could respond to different pathogens. Plants also have receptors with similarity to "Toll-Like Receptors" or TLRs. These TLRs are similar to proteins found in insects and mammals that trigger responses to bacteria and other pathogens. TLRs were first discovered in plants by Professor Pamela Ronald of the UC Davis Department of Plant Pathology. Coaker's laboratory has now isolated an enzyme, SIK1, in Arabidopsis that is the "firing pin" of plant immunity. It connects the receptors that detect pathogens to the reactive oxygen that kills them. "This particular kinase works with and stabilizes others that converge on the enzyme that makes reactive oxygen," Coaker said. "We think this is a key step." When the researchers deleted SIK1, the plants were unable to make enough reactive oxygen and were more susceptible to infections. Coaker's group is now looking for homologs of SIK1 in other plants, including crop plants. They want to know if the gene can be tuned up to boost resistance to pathogens in crops. That could lead to new treatments for plant diseases and breeding of crops that are more resistant to infections.